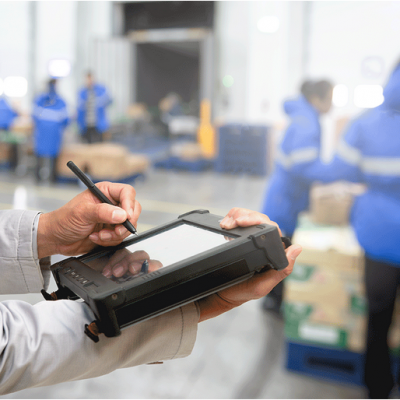 Whether manufacturing or logistics, the label printer has historically been mounted on a bench, but the labelling needs to take place in another area. A Powered Cart creates a mobile workplace – and portable power systems let you take your workstations ANYWHERE on the production or warehouse facility floor. Saito offers several solutions, with multiple configurations and power options. They allow you to print on demand saving waste and increasing accuracy. The biggest saving is the time saved from not walking to and from the label printer fixed mount station. Create greater throughput and increase revenues by mobilizing printers, PCs, scales and tape machines for a truly mobile packing station. Battery packs can be fitted to existing carts or can be supplied as complete units. Saito is a major supplier of supply chain technologies, we offer label design software, label printers, printer ribbons, and labels or tags. We have over thirty years’ experience and expertise in the coding supplies market. Use Newcastle Systems’ ROI Calculator to calculate potential savings when you eliminate unnecessary walking to and from a static computer, high-volume printer or other electronic equipment used in your work process.